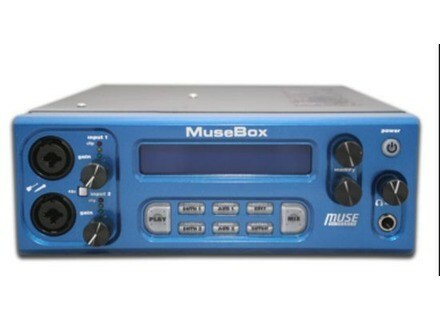 MuseBOX, Hardware Plug-in Host from Muse Research. Muse Research is offering a "sneak peek" of their new, low-cost portable virtual instrument player called The MuseBOX in booth 6729 at the Winter NAMM show. 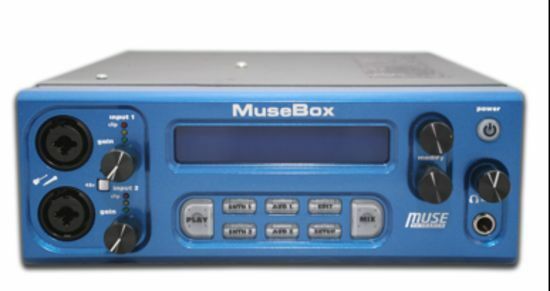 The MuseBOX is based on the same MuseMachine software technology that powers the company's RECEPTOR 2 line of virtual instrument players and features a drive for storing both the OS and plug-ins, a CF card slot for removable storage of additional plug-ins or smaller "ROMPLER" libraries, and an option for installing an internal hard drive for storing large sample libraries. The hardware I/O features 1/4-inch stereo line outputs, a 1/4 inch input, stereo S/PDIF output, front panel headphone outputs, a VGA monitor output, MIDI input, and a 2-line LCD display and rotary encoder similar to its bigger brother, the RECEPTOR 2. Like the RECEPTOR 2 line of music instruments, The MuseBOX is both a highly efficient and ultra-stable way to run virtual instruments and effects. The MuseBOX will retail below $1000 US, and is expected to ship in late Q2 or early Q3 of this year. The MuseBOX will be available from major music retailers and online providers in late spring or early summer of 2009. [NAMM] Downloadable Content For Garritan Garritan has announced the release of the [b]Authorized Steinway Virtual Concert Grand Piano, Basic Edition[.B], a Downloadable Edition of the sample-based software piano instrument developed in collaboration with Steinway & Sons. [NAMM] Cakewalk Expansion For Rapture Cakewalk has announced Craig Anderton's Electronic Guitars Expansion Pack, for Rapture and Rapture LE. [NAMM] Duende MINI At NAMM (Booth #6907, Hall A), Solid State Logic has announced tthe Duende Mini Expanded and Duende Studio Pack options.